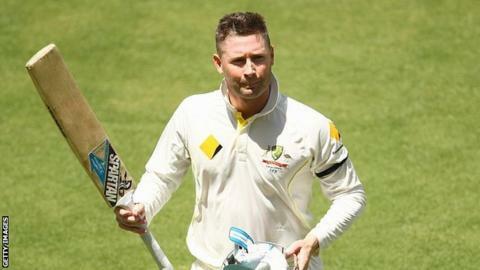 Australia captain Michael Clarke has been named the International Cricket Council's player of the year for 2013. Clarke, currently playing in his 100th Test against England in Perth, scored 1,559 runs at an average of 70.86 in the 12 months to 25 August. Sri Lanka's Kumar Sangakkara was voted the limited-overs international cricketer of the year. England wicket-keeper Sarah Taylor was named women's Twenty20 player of the year for the second year running. England's Alastair Cook, also playing in his 100th Test in Perth, was recently named captain of the ICC's Test team of the year. Clarke's stunning run with the bat coincided with some tough times for Australian cricket, including the 4-0 Test series loss in India and the 3-0 Ashes loss in England. "I was very surprised, there are so many guys playing so well around the world at the moment," said Clarke, who scored five centuries in the qualifying period to win the Sir Garfield Sobers Trophy and also be named Test cricketer of the year. "I'd swap it for the team to have success, that's for sure." Australia have rebounded on home soil in the return Ashes series, winning back-to-back tests in Brisbane and Adelaide to lead the five-match series 2-0 before the third match at the Waca.